I first tasted hogget back in February at River Cottage when it was served as part of the Valentines Feast. It’s such a delicious meat, stronger tasting than lamb, but not as gristly as mutton. To explain: lamb is a sheep from birth to 1 year, hogget is from 1-2 years and Mutton is from 2 years or older. I’ve been trying to get hold of hogget ever since and a smallholding friend came to the rescue. So with half a hogget in the freezer we’ve begun to work our way slowly through it. One of the best way we’ve found for cooking lamb/hogget is to slow roast it so the meat is full of taste and falls apart. By doing this you don’t have to worry about the fattiness you sometimes get with lamb as it just renders off. Dinner Diary’s Slow Roast Shoulder of Lamb recipe is divine, so easy and also works perfectly with hogget. 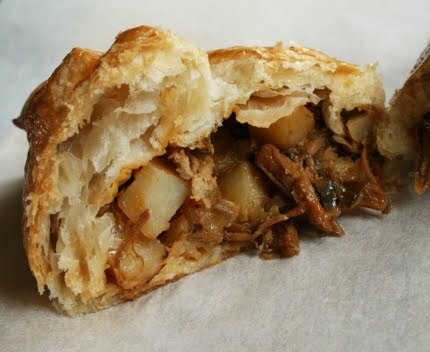 With leftovers from Sunday’s slow roasted shoulder of hogget I decided to have a go at making Hogget & Mint Pasties. Now this is why I love roast dinners as it makes the next few days of meals easy. I made 4 pasties with this recipe. I could have frozen 2 of the pasties in their uncooked state, but Hubby requested if we could have them for Lunch today. They worked far better than I expected and will certainly be making them again even if they are a tad rustic looking. I think they would also work really well as mini pasties. Hubby helped quite a bit with the prep for these (spot the perfectly diced veg that could not have been done by me!) as I managed to slice my finger quite spectacularly a few days ago while making my lunch. Who knew a bread knife could hurt so much and cause the amount of blood it did. I’ve been banned from going near the Microplane, I’m too much of a risk. This recipe is partially inspired by a recipe I had cut out of the newspaper and I imagine would work with a multitude of different meats and Sunday leftovers. The surprising ingredient in the pasties is a small amount of ketchup. This helps to thicken and sweeten the gravy. 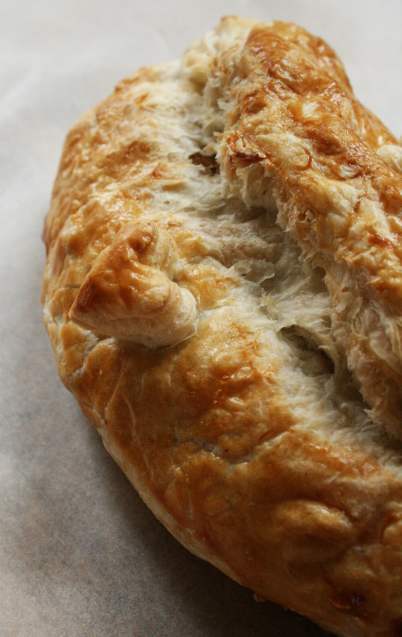 There is also a bit of a debate as to what type of pastry a pastie should be made with. I prefer puff pastry so have made it with that. 1) In a saute pan gently fry the potato, carrot and shallots in the olive oil until softened. 2) Stir in the mint, hogget, ketchup and stock then simmer until the sauce has thickened and you are left with only a small amount of liquid. If the sauce is too thin it’ll make the pasties soggy. Put the filling to one side while you sort out the pastry. 3) Preheat the oven to 200oc. Roll out the pastry until it is 3mm – 5mm thick square. You can either cut around something like a plate or do what I did: Cut the pastry into quarters and freehand a kind of circle (or a rounded squircle if you want to be technical) in each quarter, by doing this I waste less pastry. 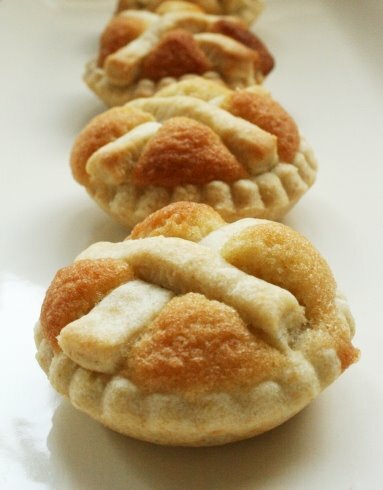 4) Brush the edges of the pastry circle with beaten egg then place 1/4 of the filling in the middle of the pastry. Bring up the edges and pinch them to make a pastie shape. Place on a lined baking tray and brush with beaten egg. Put 2 small cuts on each side of the pastry to help stop it going soggy. Bake for 20 min until the pastry is crisp and golden. Best served hot. Ok, I’ve fallen off my “get healthy for the 3-peak-challenge” diet in quite spectacular style. Up until yesterday I had been quite restrained but seeing a picture of cheesecake brownies on Tastespotting tipped me over the edge. Plus Summer Holiday Boredom is hitting big style and I sometimes I just NEED to bake to kill time. Anything to avoid watching the horrors of Jeremy Kyle & Loose Women. Given that one of my most requested cakes from co-workers is my Baileys Cheesecake (I have refined my presentation of this dessert since that photo was taken!) 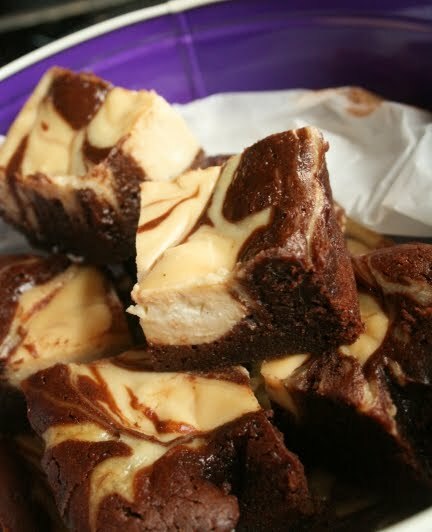 I felt obliged to have a go at making Baileys Cheesecake Brownies. Well, I do have a penchant for sneaking in the odd glug or two of Baileys into various baked items. Right up there on the unhealthiness stakes, but goodness do they taste good. The brownie part isn’t exactly what I would call a brownie, but it is still a luscious, moist, rich and dense chocolate cake. The one minor criticism Hubby had to make about these was that I had used Baileys with a hint of coffee rather than plain Baileys as it’s all I had in the house. Um…he hates coffee. I’m not complaining though as it means more for me! Saying that he isn’t saying no when I offer him one with a cup of tea. Tonight we’re having them for pudding with a generous spoonful of Cherry Beer Ice Cream. 1) Preheat the oven to 150oc then Line a 23 cm/8 inch square cake tin with baking parchment. Melt the chocolate with the butter in a bain marie. Remove from the heat, add the sugar and stir then leave to cool slightly (if you don’t do this you may end up with scrambled egg brownies). 2) Beat the eggs one at a time into the brownie mixture, beating until it is glossy. Stir in the Baileys until well combined then gradually fold in the flour then pour into the cake tin . 4) Bake for 25-35 minutes, or until just set in the middle. Leave to cool in the tin for 15-20 minutes before cutting into squares and serving. 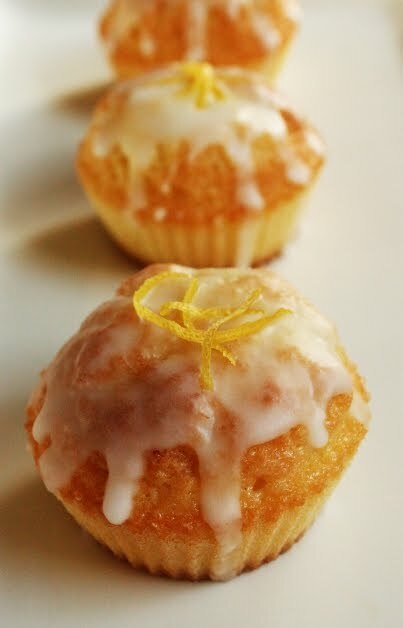 Now for something different, I blog about something that isn’t sweet! I haven’t blogged about main meals for a while as 1) I haven’t cooked anything particularly exciting 2) by the time we eat in the evening we just want to eat, presentation and faffing with cameras is low down on our priorities. I’ve been wanting to make a risotto sans rice since I ate a delicious spelt risotto at River Cottage. I managed to pick up some spelt grain risotto when I visited River Cottage Canteen, but since returning I’ve found it nigh on impossible to find spelt grain for sale. I’ve scoured health food stores and even a vegan wholefood shop (which is usually great for this type of thing). When I enquired about it I was told “they don’t sell it as their customers have no call for it” making me think I had committed a huge vegan faux pas. Given that spelt grain seems to be as rare as hen’s teeth I had to settle for a similar grain – barley. Barley is being peddled as the new “Superfood” due to it’s low GI, high fibre qualities and because of this has the ability to lower cholesterol along with being a good source of niacin. The main reason for us eating it is that it is filling and I like the taste of it. It does make a great replacement for the traditional rice in risotto. I also like barley in soups. To make this I also used something called Souper Mix. It’s a veg stock recipe from River Cottage Preserves Handbook in which you preserve finely diced stock vegetables & herbs in salt then rehydrate them in boiling water to make a stock. It’s a fantastic way of using up lots of vegetables and makes a really flavoursome stock. I can’t find the recipe anywhere online so plan to blog about it in the near future. The photo another prime example of my inability to finely dice vegetables, check out the onions – absolutely shocking. I really should just whack them in the food processor. This risotto is based my traditional risotto recipe, the only difference really being is that it takes longer for the barley to soak up the stock. By using the some of the leftovers from Sunday’s Roast Chicken you can truly call this Economy Gastronomy. 1) Gently fry the onion and garlic in the olive oil in a deep saucepan for 3 min. Add the barley and stir for a further 2-3 until the barley begins to brown. 2) Pour in the wine and turn up the heat until the wine is absorbed. Gradually add stock 1 ladle at a time, each time waiting for the stock to be absorbed before adding more. After the 2nd ladle add the chicken. When you have one ladle of stock left, add the peas, thyme and seasoning. 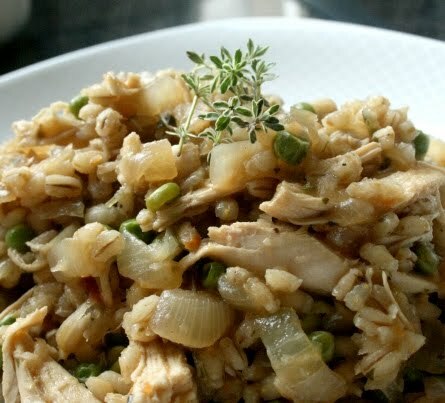 3) The risotto is ready once all the stock has been absorbed and the barley has a very slight bite. If you need it add more stock. Stir in the butter. Leave for 2-3 min before serving. As I’ve mentioned before I have a bit of a thing for kitchenalia. Trust me, if I had a big farmhouse kitchen nailed to all the beams would be random pans and Victorian jelly moulds. At moment my collection is very much orientated around vintage cookbooks. I love looking at the recipes and ingredients. The one thing great about a lot of old cookbooks is that they are plain and simple. They don’t beat around the bush and unsurprisingly the recipes often work really well. They are also the kind of book that tells you how to be a good wife and look after your servants. I think Hubby is still wishing I would follow some of the advice in the books. Stuffed in the back of one of the books given to me by Grandma was a catalogue from one of the local grocers. Unfortunately the grocer is no longer but some googling shows it was an important and well known place within the local community. 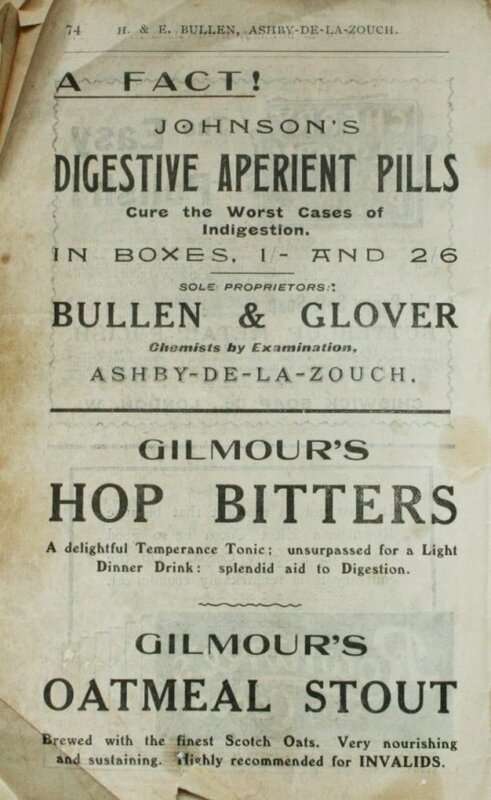 Within the catalogue is adverts for long-gone products, apart from the Rowentrees Cocoa. 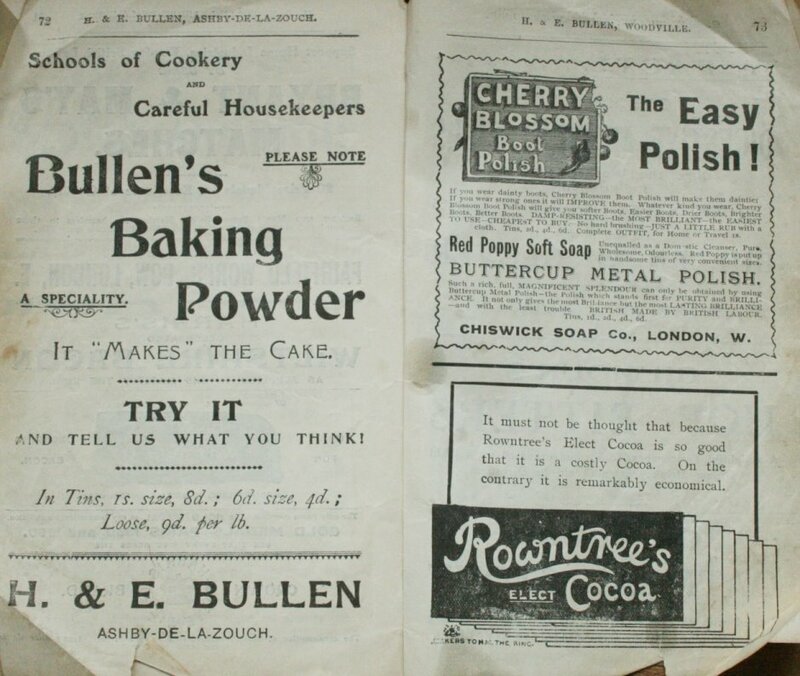 The Rowentree advert means I can date the catalogue to around 1910, so Grandma must have been given this cookbook by her mother. I love looking at the claims the various products make. I don’t think you would get away with it now! By clicking on the pics you can see the adverts in more detail. Yesterday I had the craving to make Jam Tarts and while flicking through a copy of a Good Housekeeping book called The Home Book, from around 1920’s-1930’s, I stumbled across a recipe for Welsh Cheesecakes. One thing about old cookbooks, they often don’t have pictures, however they sometimes tell you how to present the dish. Even with the basic presentation instructions I still wasn’t 100% what they were meant to look like, let alone taste like. To be honest I’m not sure why these are called a cheesecake as there is no cheese in them. Some research suggests that the term “cheesecake” in olde English may mean just a tart, but I’m not sure. A few years ago I did have a bit of a pastry phobia and have tried many shortcrust recipes over the year, but always come back to this recipe as it always works perfectly. These cakes are essentially jam tarts with a basic sponge topping. The pastry worked out at the perfect short texture and the buttery sponge helped offset the sweet jam. 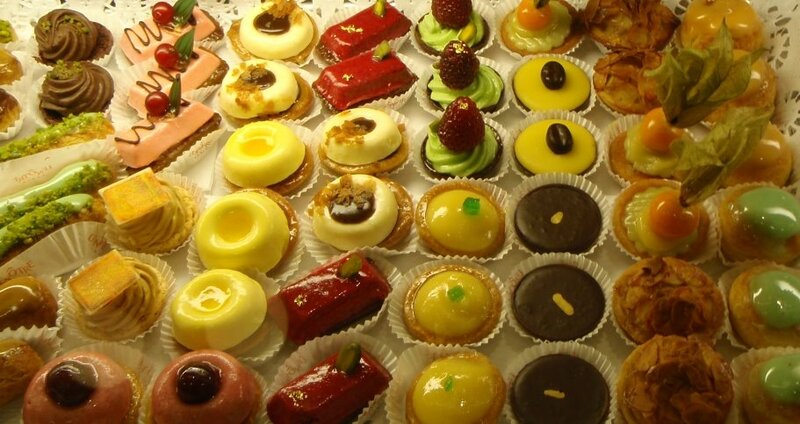 It’s very difficult to just eat just 1 of these little dainty cakes with my morning cup of tea. Tonight we may have a few warm with some Cherry Beer Ice Cream. mmmmm… As this is a 80 or so year old recipe I’ve kept it in old style ounces rather than grams. 1) First get started on the pastry. Sieve the flour, salt and baking powder into a bowl then rub in the butter until the mixture resembles breadcrumbs. 2) Add the chilled water a small amount at a time and mix with a knife until you have a good dough. Roll into a ball, cover in cling film and chill in the fridge while you make the filling. 3) Cream together the butter and sugar then beat in the egg. 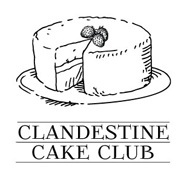 Fold in the sieved flour and baking powder until you have a smooth cake batter. 4) Roll out the pastry until around 5mm thick. Using a 3 inch cutter, cut rounds and press gently into a bun tin. Place a small amount of jam on top of the pastry then top with 1 tsp of the cake batter. Using the scraps place a cross of pastry on top of the batter. 5) Bake at 200oc for 10 min, or until well risen and golden. 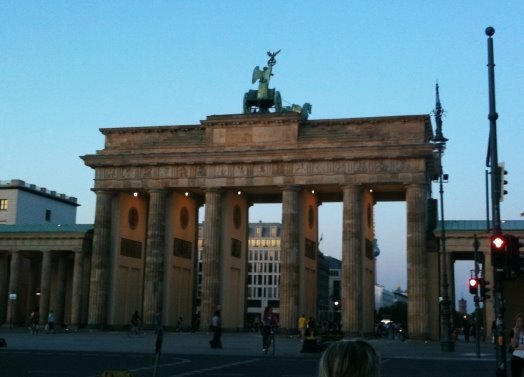 Last week I returned to somewhere that I left 17 years ago and holds strong memories for me – Berlin. And quelle surprise most of the memories relate to the food there! As a child I lived there for 3 years and saw the wall fall down. I also own piece of the wall I chiselled off with my own fair hands. I admit I was nervous about returning and worried it wasn’t going to be anything like I remembered. Although, yes, Berlin had changed, it didn’t disappoint. Prewarning – not the best of photos as we didn’t take our DSLR out with us. 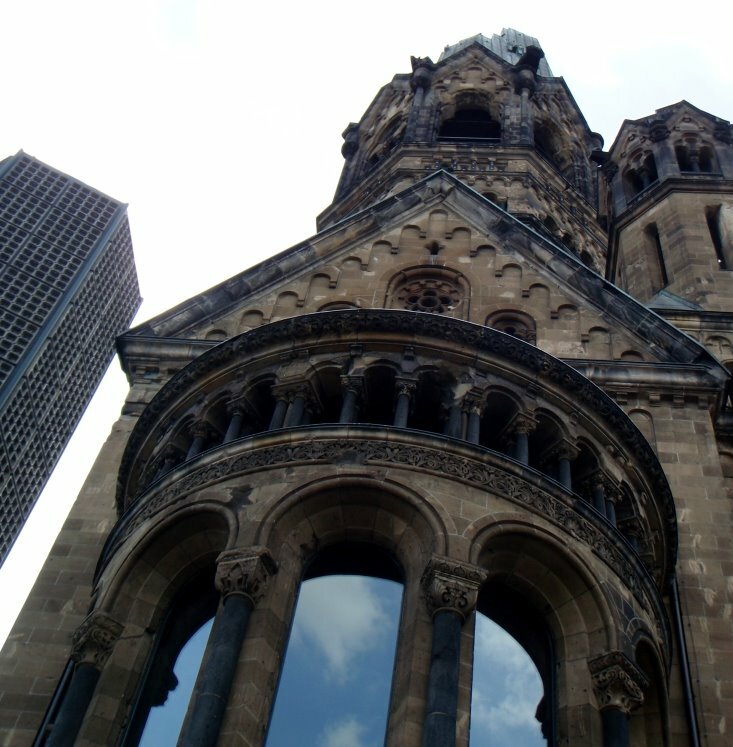 After a bumpy landing at Schönefeld Airport we headed to our Meliá hotel on Friedrichstraße by the Spree. I had read good reports of it on Trip Advisor, hence why I booked it and our rooms were fantastic with lovely views of the Spree. 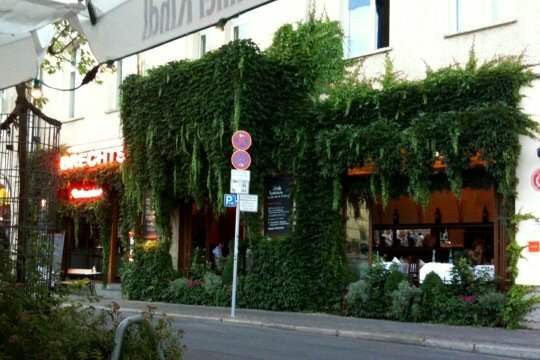 We soon headed to some of the side streets by the hotel and settled on eating at Machiavelli as the menu was extensive and had many interesting dishes, which in turn challenged my knowledge of the German language. Who knew there could be so many words for mushroom. I went for a feta & broccoli pizza, odd sounding (hence why I tried it!) but surprisingly nice. I’ve only ever seen broccoli on pizza in Germany. I also tasted my first Malzbier a non-alcoholic beer that me tastes like cola & Guinness. After dinner we went on a short sunset walk to Brandenburg Gate and the Jewish Memorial which was very peaceful in the last light of the day. Now, I had heard about the buffet breakfasts at the Meliá hotel, but nothing could prepare me for the extensive choice on offer. Churros, pancakes, various bread, fruit, yogurt, cereals, cheese, cold meats, pastries, eggs to order, fried potatoes, sausages, grilled tomatoes with pesto, rollmops, big selection of teas & coffee, champagne… you name it and it was probably there. Obligingly we all ate as much as possible for breakfast to ward off lunchtime hunger pangs. We spent the day walking around the Zoo then walking on to Charlottenberg to look for the Egyptian Museum which it turns out is no longer there and is in the process of being moved to Museum Island. All in all we ended up walking 15 miles that day, and most of that was looking for a museum that no longer exists. Lunch was grabbed on the move and for me was in the form of a delicious pretzel. During our mammoth walking trip we also took in Siegessäule and Kaiser Wilhelm Gedächtniskitche. For dinner that night we chose a place called Kartoffel Keller (English translation being Potato Cellar) – random but hearty. Certainly helped to fill a gap. One thing I learnt in Berlin is that they love sausages, potato & bread. If you don’t like these you’re stuffed. Thankfully I like all three, however I did find the odd true veggie option on their menu and decided to sidestep the meat for a change. Most restaurants don’t serve veggie meals or the “veggie” alternative was a fish dish. I chose a large kartoffelpuffer (aka latkes or potato pancake). Although they are traditionally served with applesauce I decided to top mine with vegetables, cheese and a herb butter. Surprisingly nice. Hubby ate pan potatoes with shrimps and leek. The main aim for Wednesday was to visit KaDeWe. A famous department store in Berlin, much like London’s Harrods. As a child we used to go on school trips just to look at what’s called the Gourmet Floor. 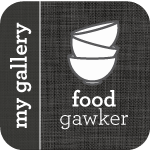 I can still remember walking around the floor in awe of all the counters stacked with the most amazing food and tanks full of lobsters and other sea creatures. Even 17 years on I was still in awe of all the counters and shocked to say we couldn’t decide on anything to buy. Everything we fancied like some of the cheeses wouldn’t have travelled back to the UK well. This was a sneaky shot of one of the cake counters. Sneaky as little bro got told off for taking photos in there. After leaving KaDeWe we headed back to Gedächtniskitche where I promised Hubby he could taste the famous German street food that is Currywurst. I wouldn’t dream of eating anything like this in the UK, but for some reason here in Berlin it felt right and tasted good! We walked back to the hotel via Tiergarten in which Hubby got quite a shock considering I forgot to mention Germany’s liberal attitude toward naturism. For Dinner we headed down Schiffbauerdamm and liked the look of an Austrian restaurant called Brechts . Now rule 1 of looking for a restaurant to eat, look at the menu & prices before sitting down. Poor Dad got a bit of a shock when we sat down and the charming waiter handed out the menus. With 6 of us sitting down for dinner this wasn’t going to be cheap, However I have to say it was one of the best and most memorable meals we had in Berlin. Between us we had Wiener Schnitzel with cranberries and sautéed potatoes; pink lamb with risotto, ratatouille and asparagus and the final dish being ox cheeks with dumplings. I was thinking of dipping out of pudding, but I’m so glad I didn’t as the Crème Bruleè taster platter I had was amazing. Well worth the 10 EUR. 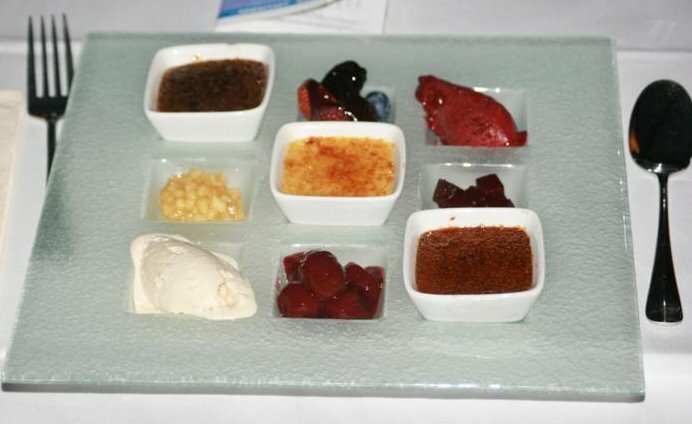 Middle row – apple compote, vanilla Crème Bruleè, blackberry sherbet (texture of cooked beetroot, but sizzled in the mouth. The final full day in Berlin was probably the hottest day. 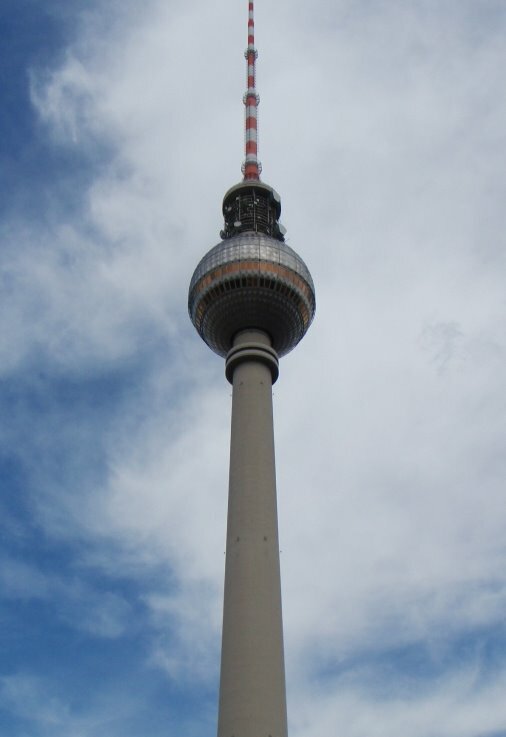 While the men headed out of town us women headed towards Alexanderplatz. The initial intention was to go to Museum Island, but the queues were too long so continued towards Alexanderplatz tower, however not before stopping off at the Radisson Blu hotel for Kaffee & Kuchen and at 5.50 EUR it was a bargain considering I was getting used to seeing a basic cup of tea selling for as much as 4 EUR in some places. They serve coffee & cake in their Atrium Bar. It was an impressive space with a stunning aquarium leading up the middle. Never before have I been served such fancy tea with a little tea timer to ensure the tea leaves steeped for exactly the right amount of time. We must have spent over an hour there taking advantage of their air-con and posh loos you don’t have to pay for (a novelty). After making a brief visit to Alexanderplatz for old times sake started to head back to the hotel when I saw a place advertising iced bubble tea. I’d seen bubble tea many a times on Tastespotting and decided to give it a try. 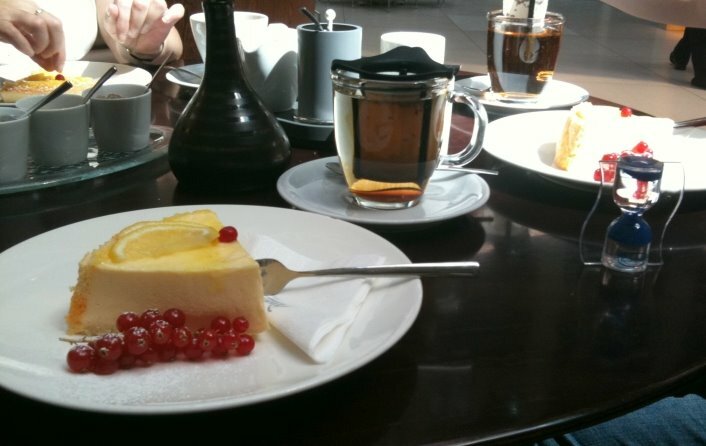 Well all I can say is that it is not my taste in the slightest and the tapioca pearls…euch. While in Berlin I also managed to introduce Hubby to some food I used eat as a child there including Bifi Rolls, Erdnuss flips (think peanut butter flavoured Wotsits) & Kinder milk slice. Junk food maybe, but the German junk food of my childhood! I was pleased as to how quickly all the German I learnt as a child came flooding back. As I learnt it in Germany I speak German with an authentic German accent, however this did cause problems when speaking to some people as they didn’t believe that I didn’t always understand them! I admit I’m far better at reading and listening to it than speaking it. Thanks to the lack of English channels on the hotel TV (there is only so many times you can watch BBC News 24) I soon got learning the lyrics to some woeful Europop and realised we are not the only country to have the I-know-it’s-dire-TV-but-I-like-it Snog, Marry, Avoid? All in all it was a fantastic trip and I would recommend Berlin to everyone. I don’t understand why it isn’t more popular. I was warned before I went that German food isn’t exactly renowned, but if you know where to look there is some real gems…as long as you avoid the bubble tea.